This semester, Yale-NUS College became home to 21 exchange students hailing from colleges in Australia, France, Italy, Japan, the Netherlands, Sweden, and the United States. While some of them have been here since last semester (Academic Year 2017/2018 Semester 1), most of them are new to Singapore and Yale-NUS. 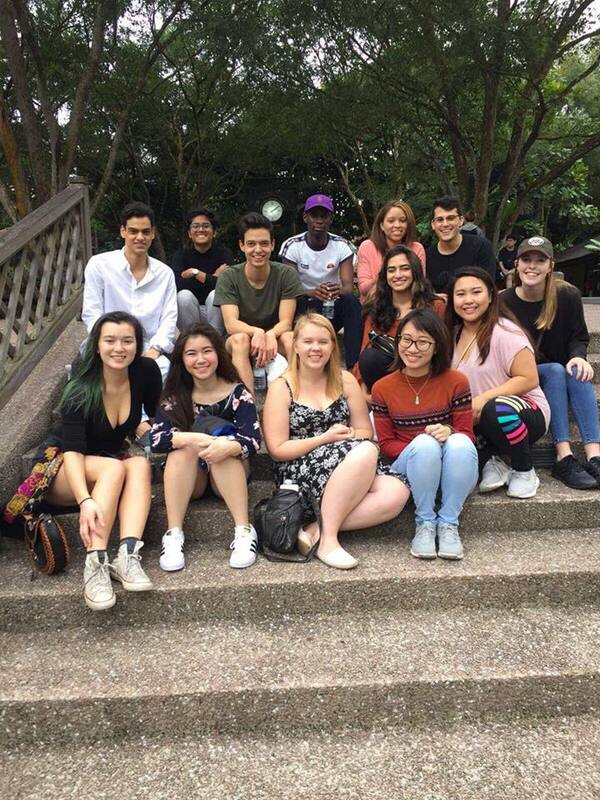 Despite being in Yale-NUS for a relatively short period of time, many of the exchange students have successfully integrated into the community, and have contributed to the college’s residential life. In this issue of The Octant, we speak to two of these students – Ingrid Saito Maciel and Altan Tutar – to find out more about their experiences. Ed: Responses have been lightly edited for brevity. Ingrid is a junior from Waseda University in Tokyo, Japan who has been at Yale-NUS since Semester 1. Last semester, she enthusiastically played soccer for the Inter-Faculty Games, created a common platform on Facebook for exchange students called Yale-NUS Exchangers, and — with the Dean of Students Office — even helped to plan a two-day orientation programme for this semester’s exchange students. I’m a junior from Waseda University. I major in International Development, and minor in Gender Studies. But here at Yale-NUS, I’m taking a bunch of really, really random courses, from urban studies classes to art history. Last semester, I took Life Drawing, which was really fun, and I even found myself drawing for three hours straight! I used to draw a lot in high school, but I never got the chance to pursue that further once I started university. It really reminded me how much I missed drawing. It was like a really random choice, actually. I wasn’t thinking of studying abroad until I got an email from my college registry reminding me that study abroad applications were closing within three days. I come from a non-residential university with nearly 53,000 undergrads, so I hadn’t been able to experience a close-knit community like Yale-NUS in university. I realized that I was “missing out on the college experience”, and decided to come here. So did it meet your expectations? It surpassed every single one of my expectations. Everyone is so friendly, it’s so easy to make friends. What would you say is the biggest difference here? The residential aspect [of student life]. Here, you can just go to your friend’s place and stay there until 5 A.M. if you wanted to. You also get this feeling that because everyone is living away from home, everyone makes sure to look after each other. I love that! But at the same time, sometimes it’s difficult to make the distinction between personal space and common space, academics and personal life. I think you need to be able to find that balance, otherwise it’s pretty tough living here in the long run. I know that some exchange students that came last semester struggled a lot with that aspect of residential life at Yale-NUS. They felt that they really needed to get out of the Yale-NUS bubble. How did you get started on the Yale-NUS Exchangers Facebook group? Last semester, a piece of feedback we got was that while the exchange students could all find some information on the Yale-NUS website, there were never any personal tips or guiding words from former exchange students. That’s when I thought, “Hey, it’d be really cool if we had some kind of platform to share personal anecdotes.” I also thought it would be really cool to extend the Facebook platform to students who were either studying abroad at Yale-NUS, or people from Yale-NUS studying abroad somewhere else. What’s your favorite thing about Singapore so far? I think some people may totally oppose me on this, but I really like the weather here. This is the type of weather that I grew up in before I moved back to Japan for college. I need consistency in my life! This is the kind of weather that connects me to various places I lived in throughout my childhood, which was spent in various tropical countries. Besides being involved in organizing the orientation program the first week of this semester, Ingrid is also interested in joining Yale-NUS Climbers, the volleyball team, and the Bhangra dance troupe. Altan is a sophomore from Davidson College in North Carolina, USA, majoring in Computer Science. Originally from Turkey, he moved to the States for college and is currently with us for a semester. Why did you choose to come here for study abroad? Well, one, when I was applying for colleges back in high school, I was thinking of coming to Asia and even applied to three schools in Hong Kong. I got into all of them, but I chose to study at Davidson because at that time, I had never been to Asia before. Although I chose to study at the U.S., I have always known that I wanted to come to Asia for study abroad. I applied with three friends from Davidson, and we are very excited about being here. The history of Singapore is really exciting for me. Just before coming, I started reading a book about Singapore and discovered a lot about how the British actually did not “create” Singapore. Also, because I come from a liberal arts college, I thought Yale-NUS should be the best fit for study abroad. If I had gone to a bigger school, I wouldn’t feel at home because I’m used to being in a small community where I could interact freely with professors. It was nice! We went to Gardens by the Bay and the Botanic Gardens. I think it gave me a great opportunity to meet all the exchange students and to find people whom you can travel with. I’m trying to learn Chinese, even though I acknowledge that Singapore is not the greatest place to learn since everyone speaks English. I’m trying to go around the city and discover new places. I’m also in the Leadership Fundamentals course. The first lecture was fascinating, and I learned that being a leader requires you to have experience meeting people from many backgrounds, and Singapore is a great place to do that. Are you joining any student organisations in your time here? I’m planning on joining Yale-NUS Data Science, and the Philosophy club. I’m really trying to seek opportunities within Yale-NUS, even though some exchange students just take classes and travel around. I want to understand the culture and learn as much as I can, and get the best out of it. I’m still planning to travel, though. This might be too quick to tell, but what’s your favorite thing about Singapore so far? People have been friendly for the most part, especially my suitemates. I like the campus, and the fact that it’s really close to UTown. Having already spent over two weeks in Singapore, Altan finds that the biggest difference that he has felt thus far is between the social structures of the American south and of Singapore, both within and outside of the college environment. Welcome to the Yale-NUS family!